This topic was on my mind (and on my to-write list) for a very long time. Finally, I had the time to organize what I want to write about it in my head. I wonder what is your take on this matter – be sure to leave a comment below! What does it mean to design something? What I really like about FEA is the fact that it is a tool. It’s not a crystal ball that simply grants answers, and to be honest I think this is what makes it so great! When you will run an analysis you will get outcomes, and it’s only up to you to decide what you will do with them. It’s obvious that you need to post-process results… the question is – what does it mean? It all starts with stress! While checking equivalent von Misses stress is great, there are other things worth doing. One of them is checking different stress components. 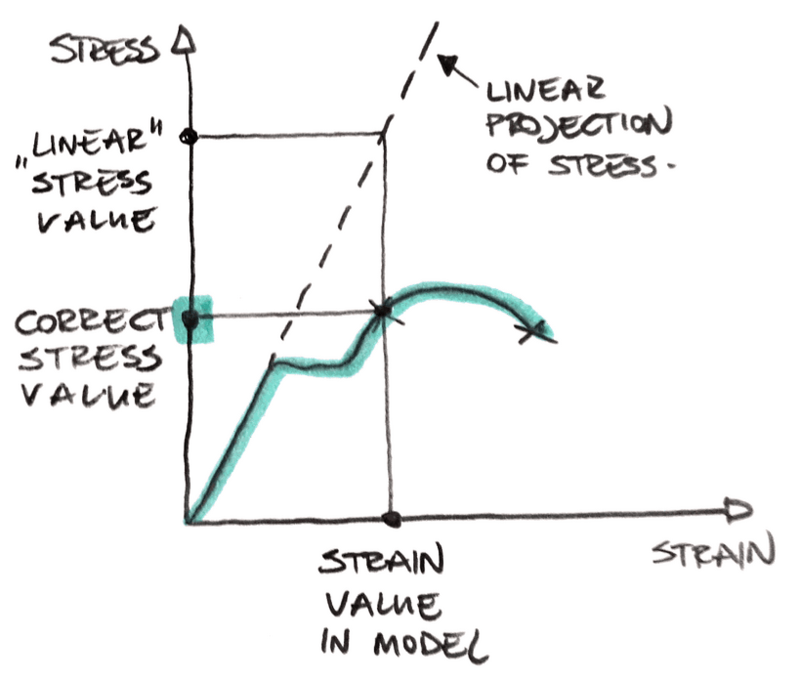 While equivalent stress nicely shows the overall “hurt” your model is taking, stress components will show you what is going on. I think it is good to think about it like that: what happens in the model is a rather complex thing. It’s impossible to describe it with just one number. This means that whatever von Misses stress does it must “loose” a lot of information along the way to produce this one number. If you are using linear analysis you will get stresses that are much higher than yield and doesn’t have real “physical” sense. You can read more here. If you are using materially nonlinear analysis after yield stress remains almost constant (or simply constant) depending on the material model. This means that it is actually hard to draw conclusions from it when the “red zone” gets bigger and bigger. This is why using stress as an indicator of “hurt” to the model works, but usually in models that don’t have stresses higher than yield. In such cases, answers are obvious without any doubt. However when you go into “higher stress” models where yielding can happen things are getting more and more tricky. Checking more than “von Misses” stress makes sense. Equivalent (von Misses) stress is great, as it shows the overall “hurt”, but seeing different stress components (like normal stress in direction X) tell you what is going on in the model. … unless you check plastic strains. You see when material yields the stress remains more or less constant for a time. However, the plastic strain constantly increases. This means, that when the stress becomes constant in an area (because of yielding), you can simply check strain to check “where you are”. There are even codes (like DNV-RP-C208) that states how much strain is allowable in different scenarios or in different conditions. This makes it super easy to use in materially nonlinear analysis. Is strain design “a thing”? I’ve read someone’s opinion, that inexperienced users use stress while experienced users use strain in design. I’m not sure if this is true (what do you think?) but “getting this” definitely changed what I understood. 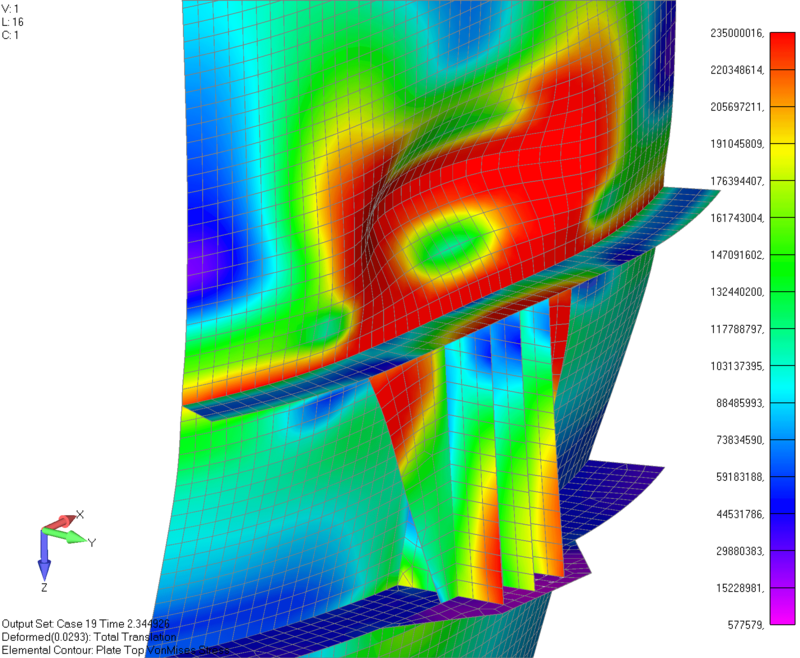 I think that using strain in design was one of the major steps in my career when it comes to FEA. Somehow it made me “click” in few places at once and I understood a lot of things better. Have you read my post on how the material nonlinearity works? One of the examples I used there came to me thanks to this realization. I hope this will help you to get there faster if you haven’t used strain in design before! Strain helps if you can’t read outocmes from stress! In case of materially nonlinear analysis, checking plastic strain will give you all information you need on where you are on the capacity curve of your material! Just establish a limit strain you will accept and you are good to go. Just don’t forget to check mesh convergence if necessary! Strain is not all there is! While strain is a great indicator of what is going on in the material, don’t forget to check if stability of the model is ok. Even if elastic buckling was not an issue, plastic buckling can happen. This is because after yielding deformations are in a certain sense “free” in region that yielded. This naturally make buckling easier as you can see below. Be aware that even if strains are small, yielding can still cause a plastic collapse, and you need to check that separately! This is a topic that is a bit separate from the other two I think. But it doesn’t mean it is unimportant! As I finished civil engineering it is easy for me to see that things not only have not to break but also should not deform all that much. In almost all civil engineering codes there are requirements about allowable deformation of different parts of the structure. I would say this aspect is the first part of rigidity design. You just plot the deformations of your model, and then you check if you are ok with them. Usually, you will know what is “allowable”. Either by experience, customer expectations or simply code requirements deformations tend to be nicely defined. Sure there are exceptions, but as a general rule, I would say this is accurate. This is however only the first part. If the deformations are “high” you will catch everything you need with this. But when they are small there is another issue. The rigidity of different elements influences how the load is distributed in the model (gummy bears anyone?). If the total deformations are high you will notice what is working and what deflects too much. You will actually “act” to fulfill the criteria. When the deformations are small this requires effort to notice. Simply because all deformations are acceptable! One could even say “why should I bother?”, and this is a justified question! If stress levels are ok, deformations are acceptable and there is no unacceptable strain, then this is a good design. In such case, you can simply ignore this part… unless you want to optimize the element. If there is a piece that is substantially less rigid than others it will take much less load. The question here is “should I fix this”? You can either remove the less rigid element or strengthen it to get the maximum from it. One of the two will most likely optimize the solution. I would say all the methods I have described are needed. Often people refer to their job as to “stress design”, but obviously there is more to it. I think it is a good idea to mention strains and rigidity from time to time, simply to make everyone aware of this. Post processing isn’t as easy as it looks I would say. There is always something new to learn, and I hope you have learned something here. If you want to learn even more about FEA, you can learn some useful things in my free FEA essentials course. The fact that analysis converged does not mean that everything is ok. It simply means that the solution was found that met convergence criteria. However, it is your job to check if that solution is “acceptable”. This means that checking strains and plastic collapse is your responsibility. Sir, you given lot of information that I have to study of it but is there a book of yours so that I can study well. There lot of doubt there in my mind that I couldn’t be solve myself. Sadly, I don’t have any books yet. I’m working on one, but it will take some time. i have one question, is it true that von mises stress is only used for ductile material? As for brittle material many suggests Max.Principal stress? Why it is useful to use von mises stress during post processing? Yes – von Misses stress is used in the ductile material. There are other hypotheses like Tresca-Guest that may be a better fit. Why von Mises stress is useful… this is a very difficult question to answer shortly. And I don’t think I’ve made a post about it (great question BTW!). I would say that this is because you get entire stress tensor “shortened” to one value – so it is easy to interpret it, and decide how close to yielding are you. Of course, you lose a lot of data in this “shortening” but the “sense” of overall capacity `usage remains (you just don’t know if the “stress” comes from shear or tension or compression or whatever). This means that while von Mises is definitely the most popular tool it is definitely not the only one needed.